Just when you think you are tired of soup, comes this fresh and easy seasonal recipe that uses what is plentiful at the market these days. If you need another excuse to pick up an extra bunch of asparagus, well here it is. Just a few simple ingredients make this a quick dinner option – especially when the days are longer, warmer, and the last place you want to be is cooking in the kitchen. The asparagus really shines in this light and earthy soup that tastes of spring. Serve alongside fresh, crusty bread, or a grilled cheese sandwich. Heat butter and olive oil in a large stock pot. Add the shallot and a generous pinch of salt, and cook until softened and translucent. Add the chopped asparagus and cook for 1 minute. Add the chicken stock and bring to a boil. Lower the heat to a simmer, and continue cooking until asparagus is tender, about 15 minutes. Remove from heat, add the spinach and parsley and blend with an immersion blender. Return the soup to the stove and heat through, season with salt and pepper. Serve immediately. I know peas are not everyone’s favorite vegetable, but for me they remind me of two things – spring and my childhood. Growing up, my grandmother grew peas in her garden, and we used to eat them freshly picked when they are at their sweetest. As soon as peas are picked, the sugars quickly turn into starch. For this reason, peas are most commonly available frozen, as that is the only way to quickly preserve their sweetness. Fresh peas need to be cooked as soon as you buy them, and to me it is worth the hassle of shelling them. Sure you can always buy frozen peas, and asparagus is available year round, but the short time of the year when these two vegetables are at their peak of freshness is like Christmas to me. 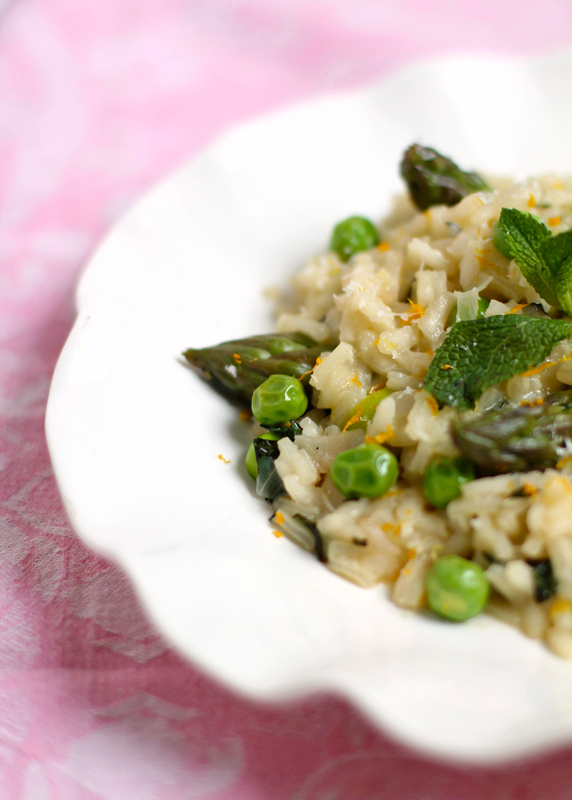 This springtime risotto highlights the sweet and fresh flavor of English peas and fresh asparagus – mint and lemon zest add the perfect flavors to round out the dish. All I am saying, is give peas a chance. Heat the chicken stock in a pot, keep at a simmer. In a large stock pot, or any heavy bottomed pot, melt the butter and olive oil over medium-low heat. Add the minced shallots and a pinch of salt, sauté until translucent. Add the rice, stir for about one minute until the grains begin to become translucent around the edges. Pour in the wine, and stir until liquid is absorbed. Add one ladle of stock, stir frequently until liquid is absorbed. Add another ladle of stock, and stir frequently until the liquid is absorbed again. Repeat this process until almost all the stock has been used, and the rice is cooked but still al-dente. The entire process should take about 20 minutes. About five minutes before the rice is done cooking, stir in the peas and asparagus. Add more chicken stock as necessary to continue cooking the rice. Once the rice is cooked, stir in the parmesan cheese, lemon zest, and mint. Season with salt and pepper, serve immediately. Asparagus season is in full force and I eat it just about every way possible. Roasted, steamed, raw, in soups, in salads – by the time June hits I am ready to not look at it again until next spring. Asparagus is tender and sweet, so it doesn’t need much more than a quick roast in the oven to make it ready to enjoy. 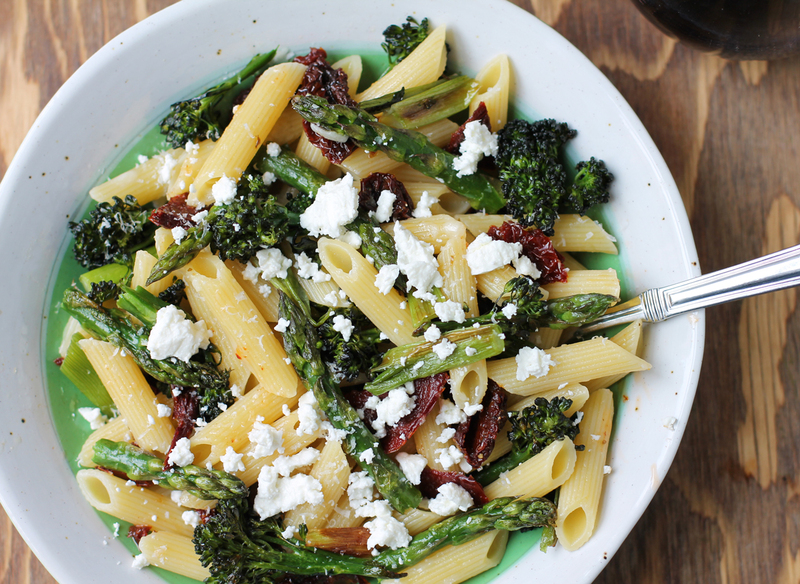 Here I roasted it with broccolini and scallions, and tossed everything together with penne, sun-dried tomatoes, and goat cheese. It’s a complete meal that is hearty, seasonal, and full of delicious healthy vegetables. Preheat oven to 425º. Cut asparagus, broccolini, and scallions into 2 inch pieces and place on a baking sheet. Toss with olive oil, salt, and pepper. Roast in the oven for 10-15 minutes, until vegetables are tender and starting to brown. Cook the penne in salted water, and reserve 1/8 cup of the cooking water. Toss the pasta with the roasted vegetables, water, parmesan cheese, parsley, and sun-dried tomatoes. Season with salt and pepper to taste, and top the pasta with the crumbled goat cheese.